Terms and Conditions | Capelle Associates Inc. These Terms and Conditions of Website Use were last updated on March 10, 2016. If you do not have the capacity to enter into a legal agreement in the province, state, territory or country in which you reside, do not access, browse or use the Site. By accessing, browsing or using this Site, and/or registering for our services, you agree to be bound by and to comply with the Terms and Conditions. If you do not agree to be bound by or to comply with to the Terms and Conditions, you must immediately cease accessing, browsing or using the Site. By accessing, browsing or using this Site, you will become a user of the Site (a “User”). Please note, before being allowed to access certain features of the Site or participate in certain activities being run on or through the Site, you may be required to: (i) register as a user of the Site; and (ii) confirm your acceptance of the Terms and Conditions by placing a checkmark in the “I AGREE” box on the registration page. If you disagree with any term or condition of the Terms and Conditions, do NOT place a checkmark in the “I AGREE” box and promptly discontinue using the Site. Certain services and activities available through the Site may require you to agree to further terms and conditions. Unless such terms and conditions expressly set out otherwise, if there is any inconsistency between those terms and conditions and the Terms and Conditions, the Terms and Conditions shall prevail. Capelle suggests that you print or save a local copy of the Terms and Conditions for your future reference. When signing up to access certain features of the Site or participate in certain activities run on or through the Site, you represent and warrant that any information you provide about yourself is true and that you will maintain and promptly update such information to keep it true and current. If you are given a username and/or a password for the purpose of accessing certain features of the Site or participating in certain activities run on or through the Site, you are responsible for all activities conducted under that username or password, and you will take all necessary steps to ensure that no one other than you uses that username or password and that that password is kept confidential. If you have any reason to believe that any password assigned to you has become known to or been used by any other person, you will inform us immediately. .You will be asked to suggest one or more usernames when you register with the Site. Please note that the assignment of a username to you is in our sole discretion. As well, we may, at any time, change any username or password assigned by us to you. We will notify you when we do so. The contents of the Site, including but not limited to, any and all software, text, data, sound, video, tools, postings, product names, trademarks, logos, trade names, programming, visual images, graphics, site design and other materials contained on or in the Site, including the selection, organization, functionality, performance and arrangement of the foregoing on the Site, is collectively the “Content”. The Content includes materials contributed to the Site by or on behalf of Capelle (the “Capelle Content”) and materials contributed to the Site by Users of the Site (the “User-generated Content”). You acknowledge that this Site contains Content that is protected by copyright, trademark and other intellectual and proprietary rights of Capelle or third parties. All Content on this Site is copyrighted both separately and as a collective work of Capelle pursuant to applicable copyright law. You agree to comply with any additional copyright notices, information, or restrictions contained in any Content available on or accessed through this Site. You may access, use and print a copy of any Content forming part of the Site solely for your own personal use, provided any copy of the Content that you make shall retain all copyright and other proprietary notices in the same form and manner as on the original. Any video materials not produced by Capelle have been made available to Site visitors with permission. Unauthorized use of any content therein is strictly prohibited without express written permission from Capelle. Names, phrases, words, titles, logos, icons, graphics, images or designs, used throughout the Site and the Content may be trade names, registered or unregistered trademarks or services marks (the “Marks”) of Capelle, its subsidiaries, affiliates or licensors, or other entities and individuals. Any use of any of the Marks without the prior express written consent of the owner of the Mark is strictly prohibited. By submitting or sending content to Capelle or otherwise making it available for display on or through the Site, you acknowledge that the content is your User-generated Content and you grant Capelle the royalty-free, unrestricted, world-wide, perpetual, irrevocable, non-exclusive and fully sub-licensable right and license to use, reproduce, modify, adapt, publish, translate, create derivative works from, distribute, perform and display such User-generated Content (in whole or part) and to incorporate it in other works (in each case irrespective of the form, media, or technology used) for the purpose of allowing Capelle to administer, operate, display, distribute and promote the Site including but not limited to allowing other sites to link to Content on the Site. You acknowledge that Capelle may need to do the following in order to operate, display or distribute the Site and agree that Capelle may do so: (i) transmit User-generated Content over various networks; and (ii) reformat User-generated Content. You represent and warrant to and covenant with Capelle that: (i) you have now and that you will continue to have all necessary rights and authority to grant the licenses set out in section 4.3; and (ii) the User-generated Content that you contribute to the Site will not infringe any proprietary right of any third party. You also represent and warrant to Capelle that any “moral rights” in any User-generated Content that you contribute to the Site have been waived and that Capelle, and its successor and assigns may rely on those waivers. With the exception of any User-generated Content that includes personal information, you agree that all User-generated Content that you contribute will not be considered confidential. You should maintain a back-up copy of any User-generated Content that you contribute to the Site. In any event, Capelle will not provide a copy of that User-generated Content to you. Additionally, Capelle is not responsible for User-generated Content that is lost or destroyed for any reason. Capelle assumes no obligation to update the Content. Capelle reserves the right to change any and all Content at any time without notice. Capelle, its licensors and suppliers are not responsible for any Content other than the Capelle Content. With respect to Content, the person who contributes the Content to the Site is responsible for the Content. Consequently, Capelle does not provide any representations, warranties or guarantees with respect to User-generated Content, its quality or its accuracy. Before using or relying on any User-generated Content, you should take reasonable steps to verify its accuracy, completeness or usefulness: you are using it at your own risk. Additionally, views and opinions expressed in information or materials forming part of the User-generated Content do not necessarily represent the views or opinions of Capelle, its licensors, suppliers or representatives. The Content is not intended to be a substitute for professional advice. 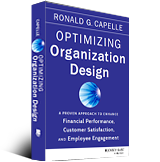 Always seek the advice of a qualified consultant with any questions you may have regarding organizational design. Reliance on any information appearing on the Site is strictly at your own risk. Except as expressly noted otherwise, Capelle does not recommend or endorse any specific products, services, organizations, opinions or other information that may be described on or through the Site or any third party website to which you can link from the Site. You may not be able to access all of the Content made available on the Site. Some Content is made available to Users only. As well, when a User posts Content to the Site, he or she may further restrict who may view that Content. Capelle may but is not obliged to review any Content. Even if Capelle did so, the review may not be to your satisfaction. You acknowledge this and the consequence that follows from it: Content accessible on or through the Site may include materials that are offensive or otherwise objectionable to you. Capelle reserves the right, in its sole discretion, to reject, refuse to post, remove or block access to any Content that is available on or through the Site at any time, without notice and without liability. Capelle reserves the right, in its sole discretion, to set limits on the amount of User-generated Content that you may contribute. Capelle reserves the right to refuse service to any visitor of the Site. Capelle reserves the right, in its sole discretion, to restrict, suspend or terminate your access to all or any part of this Site at any time for any reason without prior notice to you and without any liability to you for doing so. Should you violate these Terms of Service or any other rights of Capelle, Capelle reserves the right to pursue any and all legal and equitable remedies against you, including, without limitation, restricting, suspending or terminating your access to all or any part of the Site. Except as expressly set out in the Terms and Conditions, Capelle cannot ensure the privacy, security or authenticity of any information, instructions or communications you send to us or that we send to you. Capelle will not be responsible for any damages or loss, of any kind, that you may incur if you communicate confidential information to us or if we communicate such information to you at your request. Capelle uses reasonable commercial efforts to comply with its obligations under Canada’s Anti-Spam Legislation (CASL). If you become aware of any violation, or potential violation, of CASL by Capelle, you agree to promptly alert Capelle so corrective action can be taken by Capelle. Capelle’s applicable contact information is set out in section 12.3 below. Products, materials, information and services, including and without limitation, all Content, are provided on an “as is” and “as available” basis and without representations, conditions or warranties of any kind, either express or implied, including (without limitation) any warranties concerning the availability, accuracy, appropriateness, reliability, timeliness, usefulness of the Site or the Content or any warranties or conditions of merchantability, merchantable quality, fitness for a particular purpose, title, or non-infringement of proprietary rights. Capelle assumes no responsibility for damage or loss to your computer or computer system as a result of use of the Site. Capelle is not responsible for, and expressly disclaims all liability for, damages of any kind arising out of the use, reference to or reliance on any information contained within this Site or obtained in response to questions asked through this Site. You expressly agree that the entire risk as to the use, quality and performance of the functions on this Site and the accuracy or completeness of the Content is assumed solely by you. Your correspondence or business dealings with, or participation in promotions of, advertisers or other third parties accessible on or through the Site, including payment and delivery of related goods or services, and any other terms, conditions, warranties or representations associated with such dealings, are solely between you and such advertiser or other third parties. You agree that Capelle will not be responsible or liable for any loss or damage of any sort incurred as the result of any such dealings or as the result of the presence of such advertisers or other third parties on the Site. Please note, if you provide any information to a third party (e.g., your contact information or credit card information), such information is collected by the third party and not by Capelle, even if you made a purchase from a third party website that was linked from or framed within the Site. IN NO EVENT WILL ANY OF THE CAPELLE PARTIES BE LIABLE TO YOU OR ANY PERSON WITH RESPECT TO DAMAGES OR LOSSES INCURRED BY REASON OF ANY PRODUCTS OR SERVICES RECEIVED ON OR THROUGH, OR DESCRIBED OR ADVERTISED ON OR THROUGH, OR RECEIVED THROUGH ANY LINKS PROVIDED ON, THE SITE. FURTHERMORE, THE CAPELLE PARTIES EXPRESSLY DISCLAIM ANY AND ALL LIABILITY FO THE ACTS, OMISSIONS OR CONDUCT OF ANY THIRD-PARTY USER OF THE SITE OR ANY SPONSOR OR ADVERTISER OF THE SITE. It is the policy of Capelle to investigate and respond to claims of intellectual property infringement. Capelle may change, modify, suspend or discontinue all or any aspect of the Site at any time, including the availability of any feature, database, or Content, without prior notice to you and without any liability to you for doing so. Capelle reserves the right, at any time, to modify, alter, or update the Terms and Conditions, and such changes, modifications, additions or deletions shall be effective immediately upon notice to you, which may be given by any means including, but not limited to, posting on the Site or by electronic or conventional mail. You agree to regularly review the Terms and Conditions posted on the Site and to be aware of such revisions. Your continued use of the Site or ordering of any products following any such change constitutes your agreement to follow and to be bound by the terms as changed. Capelle may, but is not obligated to, ask you to actively confirm your consent to revised Terms and Conditions. If at any time the Terms and Conditions are no longer acceptable to you, you should immediately cease all use of the Site. The Terms and Conditions and your use of this Site shall be construed in accordance with and governed by the laws of the Province of Ontario and the federal laws of Canada applicable therein, without reference to any choice of law or conflict of law principles. Unless otherwise agreed by both parties, any disputes or claims arising out of or related to these Terms and Conditions or your use of this Site shall be resolved exclusively by binding arbitration pursuant to the Arbitration Act, 1991 (Ontario) or its successor legislation. Arbitration of all matters will be determined by a single independent arbitrator acceptable to both parties, acting reasonably, and all such arbitration proceedings shall be held exclusively in Toronto, Ontario. If any provision of these Terms and Conditions shall be held to be invalid by a court of competent jurisdiction, then that provision will be enforceable to the extent permissible, and all other provisions will remain in effect and are enforceable by the parties. These Terms and Conditions comprise the entire agreement between you and Capelle with respect to its subject matter, and supersede and replace any and all prior or contemporaneous discussions, understandings and agreements, written or oral, between the parties regarding the subject matter contained herein. Except as expressly provided otherwise in the Terms and Conditions, Capelle will not be liable for any failure or delay in its performance under the Terms and Conditions due to any cause beyond its reasonable control.